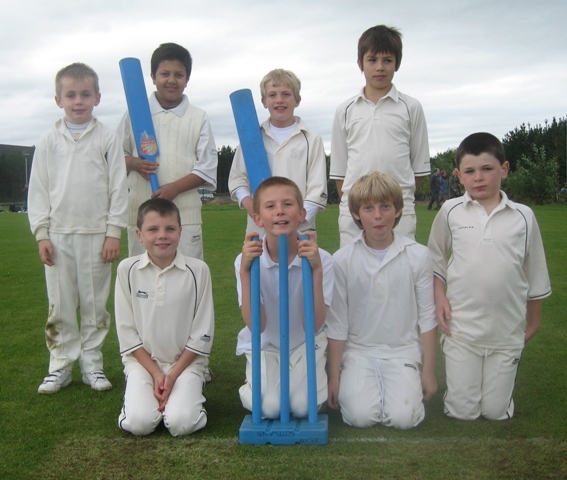 Cricket Scotland held the annual U10 Kwik Cricket Festival at Stirling last Sunday with teams from throughout Scotland attending. Dumfries were grouped with Stirling, Ayr, Drumpellier and Clydesdale, all formidable clubs, and acquitted themselves extremely well winning all their games and with everyone enjoying the day. The captaincy was rotated between Mustafa Chowdhury, Callum Jack, Dean Brotherstone and Fraser Strachan for the respective games and all won their matches and led the line with merit. All team members made an impact with Cammy Walker finding form with the ball and Chris “no byes” McBride secure behind the stumps as well as delivering a volley of 6’s against Ayr to prove his keeper / batsman credentials. Alex Chalk and Aiden Collingwood also made their mark with excellent contributions with bat and ball. A good disciplined fielding effort by the whole team punctuated by some spectacular catches including a “Paul Collingwood” effort from Dean Brotherstone enabled Dumfries to control the matches and make a clean sweep for the second year running. Thanks go to Dumfries youth cricket sponsors Annandale Insurance and Coatbridge Cold Store Construction for their continued support for local junior sport.